Feis Ile Bottles – Collectable or not? Like a swarm of wasps round a spilled Jack ‘n Coke on a hot day, the coming months are set to see the many whisky-auctioneers of the world flooded by limited bottles from this years Islay Festival. There’s almost an underground competition to see which auctioneer can get the first bottles onto the open market such is demand for these releases. For those collectors who can’t attend the annual Feis Ile (or maybe just don’t do queues), auctions are a viable means of acquiring these desirable bottles. But how do they perform as an investment? Some of the older releases are collectable icons now, the 2008 Feis Ile Port Ellen sold for £100 to the lucky few who secured a bottle on the day. It now sells for around £3,000 at auction, a truly staggering result. Can the more recent, increasingly voluminous bottlings compete as a viable liquid commodity? Over the years I’ve spoken to many Feis-goers who would pay for their annual peat-land-pilgrimage by selling the bottled spoils of their trip after the event. It’s one thing buying a bottle for £100 upon its release and selling for £3,000, but as an investment are these bottles worth buying on the secondary market? If so, which distilleries are the ones to go for? 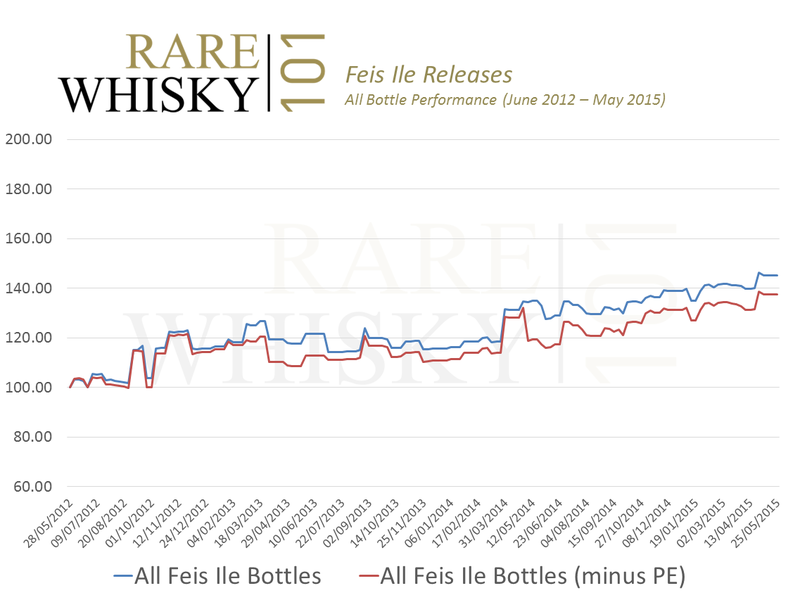 The chart below shows the UK auction performance from the start of June 2012 to the end of May 2015 for ALL Feis Ile bottles sold. Such is the impact and value of the Port Ellen release we’ve included a separate line with that bottle removed from the index. Over the three year term measured, all Feis Ile bottles have increased by 45.27%; without the Port Ellen that’s reduced to 37.41%. 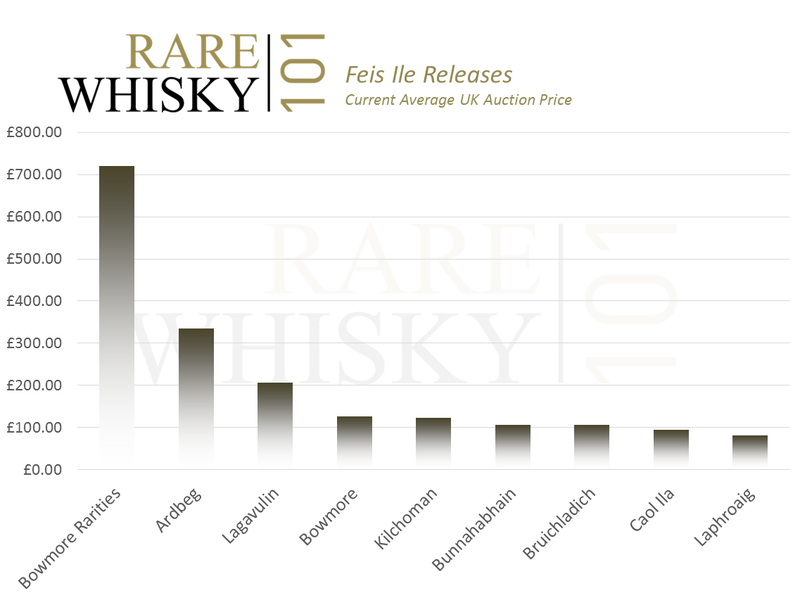 The current average price of all Feis Ile bottles is £304.40 which is taken back to £262.40 without the Port Ellen. As a full and expansive collection, it has to be said the Feis releases are not the best performing of bottles; however 45% over three years is still impressive and outperforms banks, Gold, wine and a host of other investments. Feis Ile Bottles by Distillery. In order to have some element of fairness around this we’ve taken four years releases, 2009 – 2012 inclusive, and measured these separately (noting Kilchoman released their first Feis bottle in 2010 we’re measuring three releases for them). This also gives a reasonably good period of time for measurement, if we took it right up to 2014, we’d only be looking at 12 months performance and as we all know, whisky should be viewed as a long term investment. We also created two separate indices for Bowmore, one measuring the lower priced more voluminous releases and another for the very rare more expensive editions. We had an opinion about which distillery(ies) would be the best performers. Prior to running the numbers we were very much of the opinion we’d see Lagavulin/Bowmore right at the top and Kilchoman/Bruichladdich at the bottom. The actual numbers are rather less obvious and proved to be something of a surprise. The chart below indexes the bottom four performing distilleries/bottle groups. 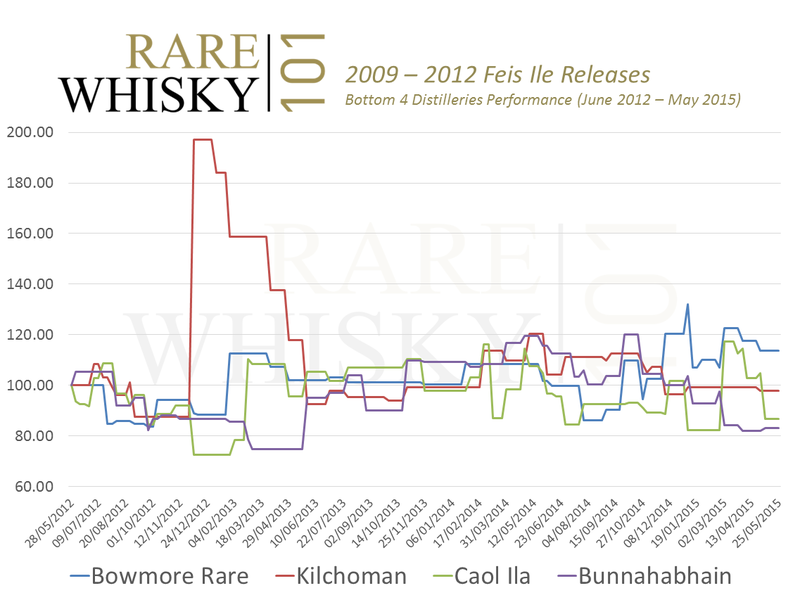 Bunnahabhain has seen something of a rapid slide since last years Feis. 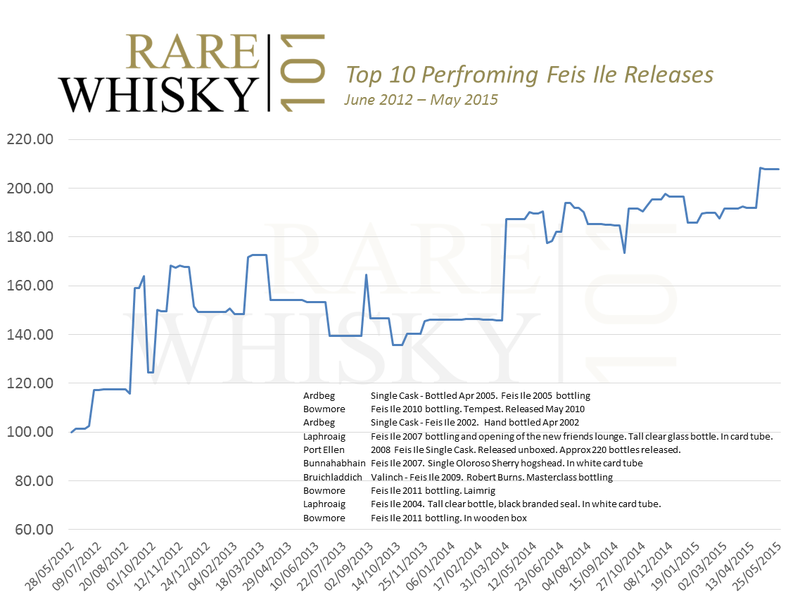 In May 2014 Bunnahabhain Feis bottles were up some 19.55% (index 119.55). Over the past 12 months values have plummeted by more than 30% to their current level. The trigger point in time is very definite, it’s on-the-nose of last years Feis Ile, so what happened? Were 2014’s bottles just too expensive causing an element of collectors turning away from the brand? Did the quality of the liquid slip significantly? Whatever the reason, Bunnahabhain’s bottles have seen a step change shift into the red. No Bruichladdich at the bottom then? Recent prices for virtually all bottles of Bruichladdich have slumped, with even the most sought after bottles tumbling in value. A good example is PC5 which used to sell for as much as £460 and now sells for £200 – £220 having lost over 50% from its peak price. The chart below indexes the top five distilleries/bottle groups. In a quite unexpected final result, somewhat akin to the recent UK general election, Bruichladdich’s bottles have out-performed the rest by a significant margin. Average prices per bottle per distillery/bottle group look more or less where expected. The rare Bowmore bottles take top spot with many other distilleries hovering around the £100 price point. 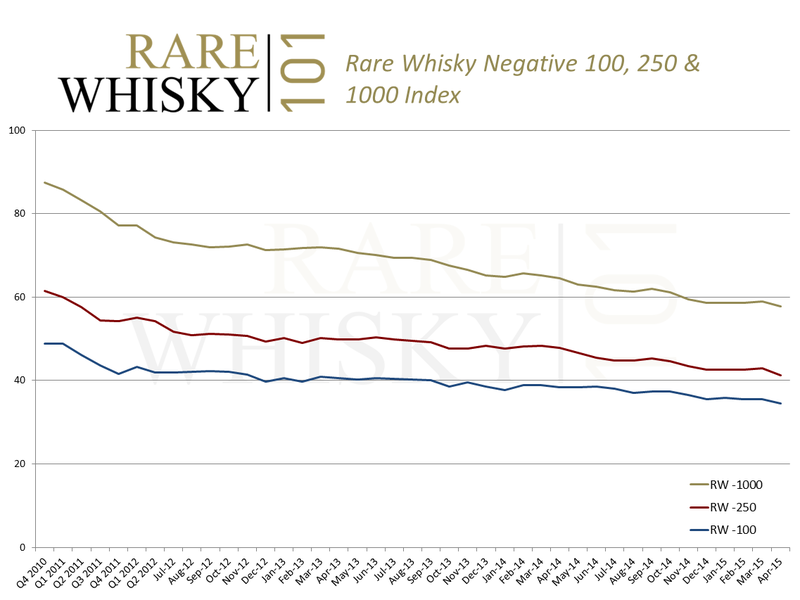 The interesting thing this allows is a number of assumptions; the rare Bowmore’s use up a lot of capital for a relatively small return, or they have historically. Conversely Bruichladdich uses far less capital and is apparently making the greatest gains, although I would still urge huge caution here. In reality, for those with a keen interest in the value of their collections from a keep or drink perspective, I’d be selecting some of the rarities and older single casks while they’re still appearing on the market reasonably frequently. This final chart shows the top 10 performing bottles from the various Feis Ile releases. Now the Feis is a relatively large scale event, the volume of collectable bottles increases yearly. Where we might have previously seen a single cask from a distillery, in order to give as many folk as possible the chance to try the liquid, we now see thousands of bottles… which is a good thing. Despite Diageo’s gift-at-the-Feis Lagavulin pricing, I still suspect these older, rarer releases will be where the future gains are seen. Values for high end collectables continue to increase as polarisation widens the gap between good and bad. April set a new record for the highest number of collectable bottles traded on the open market. The previous record in December 2014 was 4,153. Last month’s 4,309 exceeded April 2014’s volume by an impressive 55.84% (2,765 bottles sold in April 2014). Year to date, one third of the way through 2015, the total number of bottles traded stands at 13,857, some 51.54% ahead of the 9,144 bottles sold in same period last year. November and December 2014’s significant supply pushed values down, suggesting demand had finally succumbed to huge supply. The same expectation could be assumed with April’s record volumes; however, this couldn’t be further from the reality. Impressively, the vast majority of key indices moved up, in some cases significantly. On the flip-side of the value coin, less desirable bottles shifted further into red territory with record losses taking the negative indices to all-time lows. Staggering demand for Karuizawa yielded a record monthly increase of 26.26% with virtually every bottle sold on the open market hitting new record highs. In some cases the increases were vast. ‘Pourquoi fait il’, a 1980 vintage was previously selling for £1,350; one sold in April for £3,200. The sheer pace of these increases doesn’t feel sustainable, however, there would appear to be continued upside potential for those with a stake in this silent Japanese distillery. 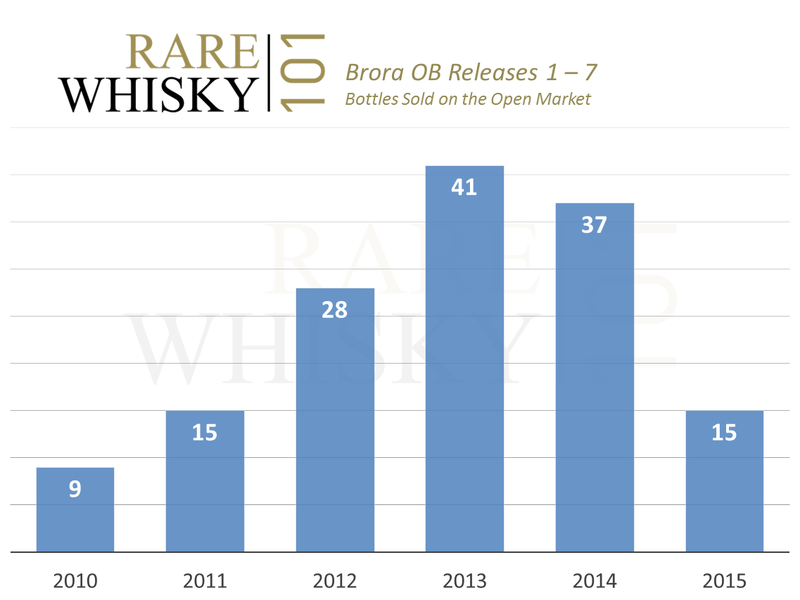 The Brora index was buoyed by increases from the 2006 30 year old release and the 2008 25 year old. The 25 year old moved from a March value of £400 to £720 in April, an 80% jump. Virtually all other bottles remained static. 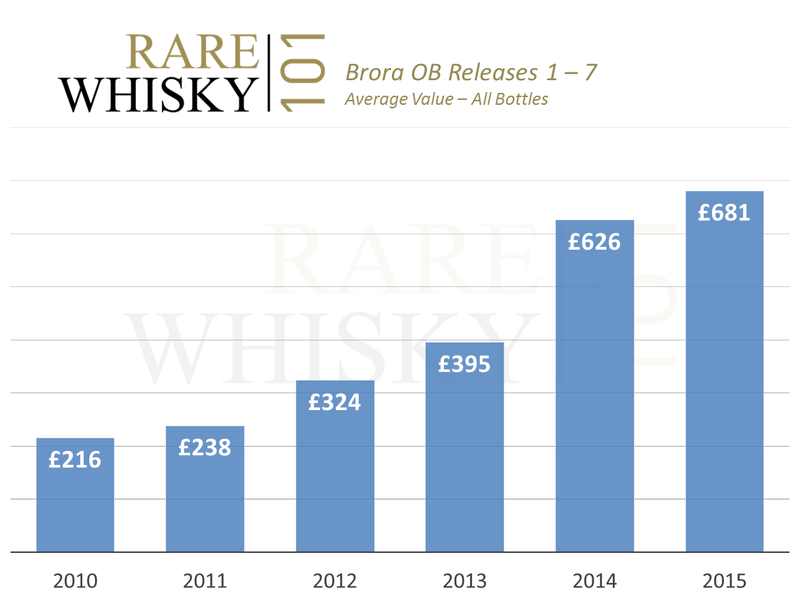 The chart below shows the average price of a bottle of Brora from 2010 to the end of April 2015 (releases 1 – 7). 2014 saw the most significant movement in average prices with a 58.48% increase over 2013. If we then take a look at the volume of Brora traded at auction, 2014 shows a clear dip in supply. The first four months of 2015 suggests we’ll see roughly 45 bottles sold this year. This might also suggest a slower rate of pure value growth noting volume at that level would be a new record. If supply declines, we would expect to see a steeper increase in prices throughout the later months of 2015. Putting aside the current static market for many more contemporary bottles of Macallan, both the 18 year olds and the 25 year olds made good progress with 3.80% and 2.55% increases respectively. With 2014 annual growth rates of 3.57% for the 18’s and 3.77% for the 25’s, April’s performance is rather more encouraging. The benchmark Icon100 index just managed to post a gain for the month, closing up 0.68%. 27/100 bottles increased in value, 52/100 bottles remained static and 21/100 bottles decreased. The best three performers in the month were the aforementioned Brora OB 25 year old (up 80%) followed by Macallan 1979 Gran Reserva (up 62.50%) and the Glenmorangie Culloden bottle (up 54.29%). April’s worst performing three bottles in the Icon100 were the Family Silver from Glenglassaugh (down 29.41%), the 200th Anniversary Oban Managers Dram (down 35%) and the Dalmore 1985 vintage Distillery Exclusive (down 52.78%). The negative indices all moved significantly further into the deep-south. The Neg1000, Neg250 and Neg100 indices tumbled by 2.05%, 3.80% and 2.57% respectively. These are among the most significant falls ever witnessed and take all three indices to new all-time lows. Polarisation and a steady decline in certain mass-volume brands are taking the brunt of the falls. Bruichladdich’s continuing broad-based slide in values marks them as the only distillery with two bottles in the bottom 10. Rapid and continued polarisation aside, April should be viewed in particularly positive light. Record breaking supply has the very real potential to cool the market as was seen in the latter months of 2014. It seems for now at least, for the right bottles, demand is set to out-pace whatever the market throws at it. 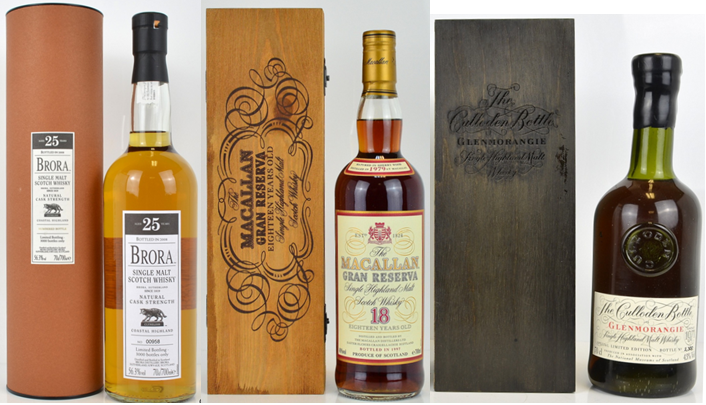 Bottle images courtesy of Scotch Whisky Auctions and Whiskyauctioneer. Yes, I blinked and yes, February was over. I blinked again and we’re on the 10th of March… I started this auction watch on the 2nd! February was a month which will be favoured as exceptional in terms of the gains in value for collectable Scotch (and Japanese) whisky. With all but one major index showing positive movement, in some cases significantly, can this month take over where the short-but-sweet February left off? 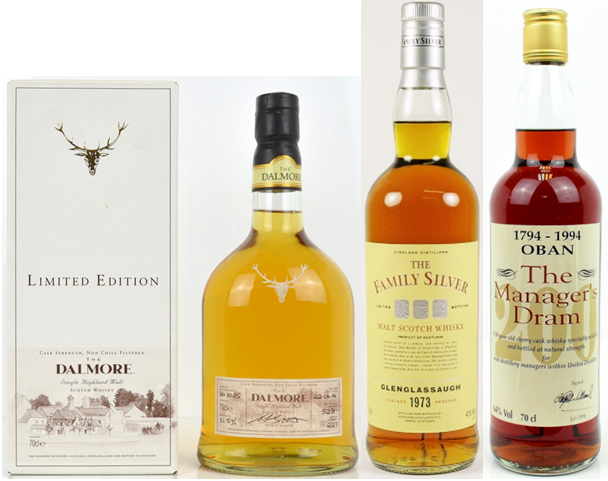 March’s first auction, from Glasgow based Scotch Whisky Auctions, ended on the first of March and brought with it some incredible results. 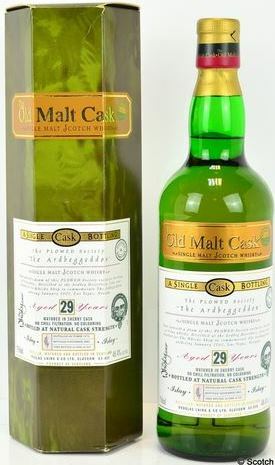 Ardbeg’s current trend continued with rarer higher value bottles achieving new records. The Ardbeggeddon 1972 vintage set the pace when it sold for £1,550, hugely exceeding its 2014 price of £825. Another good result was seen by one of just 222 bottles from cask number 1924 (1999 vintage 10 year old) which sold for £430. These younger single cask offerings used to be available from the distillery but were sadly discontinued some years ago. A set of Arran’s Icons achieved £600, nicely exceeding the £380 paid in 2013. For rarer bottles, Arran seems keen to continue its current bull-run. 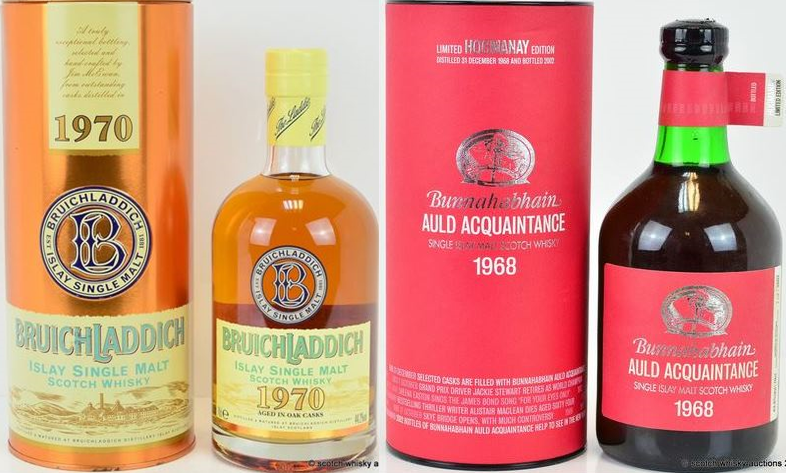 While the bulk of their bottles remained depressed, Bruichladdich’s 1970 vintage (one of the first releases under the then new ownership in 2001) hit £560 way ahead of its 2010 low of £120. Bunnahabhain’s 1968 vintage Auld Acquaintance peaked at a new record £800, £50 ahead of its previous best in January this year. In 2010 these were being picked up for £220; even further back and just £160 would have secured a bottle in 2008. Steep gains for this bottle are no real surprise… Probably Bunna’s finest? Dalmore’s older discontinued bottles and rarities performed admirably. A bottle of late 1970’s 12 year old (dumpy green bottle with ‘jigger’ cap, lacking its box) fetched £185, comfortably ahead of its 2013 previous best of £85. The 1985 vintage distillery exclusive sold for £360. In 2009 a bottle of this sold for just £55, with a previous record of £205 this is indeed significant movement. £860 is almost double last years price for a bottle of 1972 39 year old Glendronach. A near doubling in value in just 12 months is incredible (£450 in March 2014). I suspect we’ll see a lot more Glendronach records over the coming months/years. Older vintage Glenmorangie’s performed well with the (not that old to be fair) Margaux bottling in Perspex case selling for £420. In 2012 values for these had all but collapsed and bottles could be picked up for £90. Lagavulin prices in general appeared buoyant. The first release 21 year old achieved £880, just slipping past its previous best of £840. 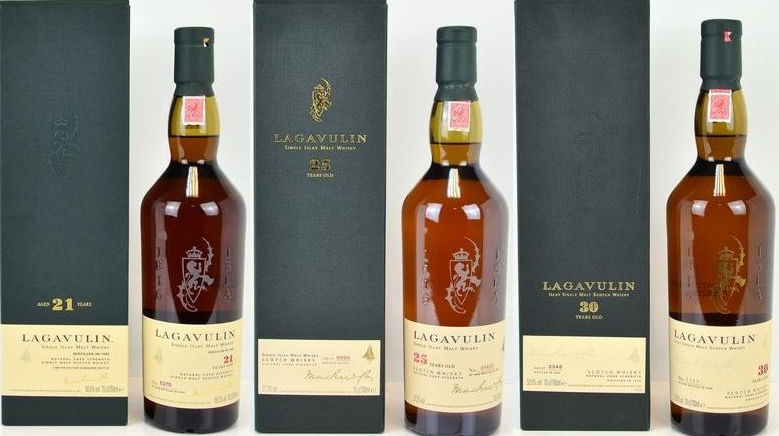 A set of three older Lagavulins (the first release 21, the 25 and the 30) now costs a combined £2,500 at auction. With an original retail price of £430 for the three, their growth looks somewhat acceptable. 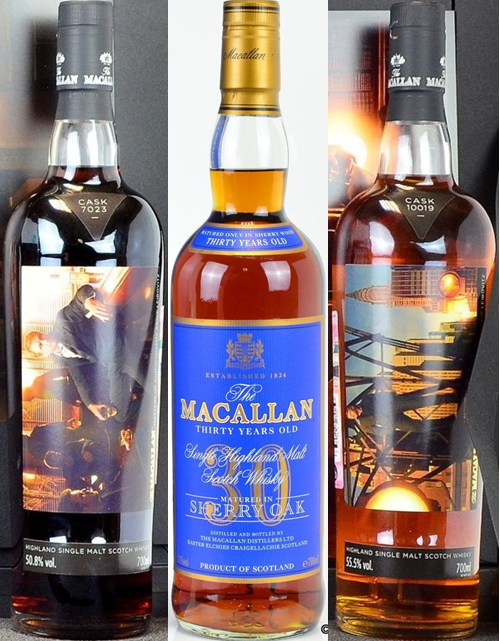 The blue box/label variant of Macallan’s 30 year old sailed up to a massive new record of £2,900. With a 2008 price of £260 this is now one of the few exclusive and illusive ‘ten-baggers’ ever seen on the open market. Conversely the Masters of Photography Leibovitz bottles (Skyline and Bar) hit their lowest prices to date. Skyline sold for £1,050 down from £1,550 in June last year and The Bar achieved £1,100 down from £1,300 in July. Along with Diageo stablemate Lagavulin, Talisker had a great auction. A massive £380 sealed the bidding for the 2007 released distillery exclusive. I do see that as a spike, but an impressive one none the less. The 34 year old ‘in a boat’ achieved £1,650 up from £990 in 2012. With simply too many other record prices to feature separately, many bottles from silent stills hit new highs. Lochside, Rosebank and St Magdalene all experienced increased demand, as did Port Ellen. In December 2012 a full-set of Port Ellen official releases (1st release to 12th release incl.) would have cost £6,805 at auction. At this recent SWA sale, that price has risen to a heady £10,390, up 52.7% in a little over two years. It would also be remiss of me to let this auction pass without mention of the mighty Japanese whisky-value-warlord, Karuizawa. I can’t reference every record but suffice to say virtually every bottle was a new high… Amazing results. I’m looking forward to seeing a 1964 or maybe even a 1960 hit the open market. 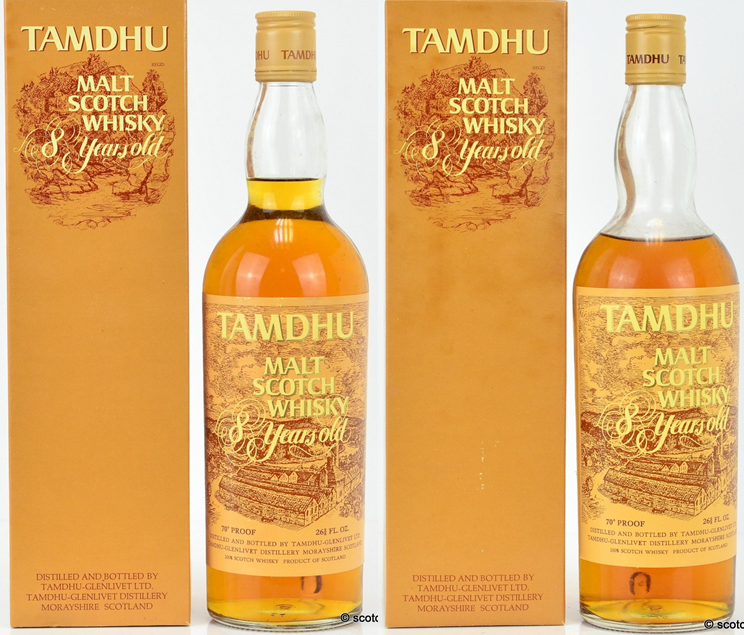 Finally, showing how important fill levels are to influencing values, a 1970’s bottled Tamdhu 8 year old with a good fill sold for £190. Exactly the same bottle but with a fill at upper mid shoulder achieved just £80. Images courtesy of Scotch Whisky Auctions.